In the buildup to the 2018 Masters Tournament, it was difficult to avoid the superlatives. 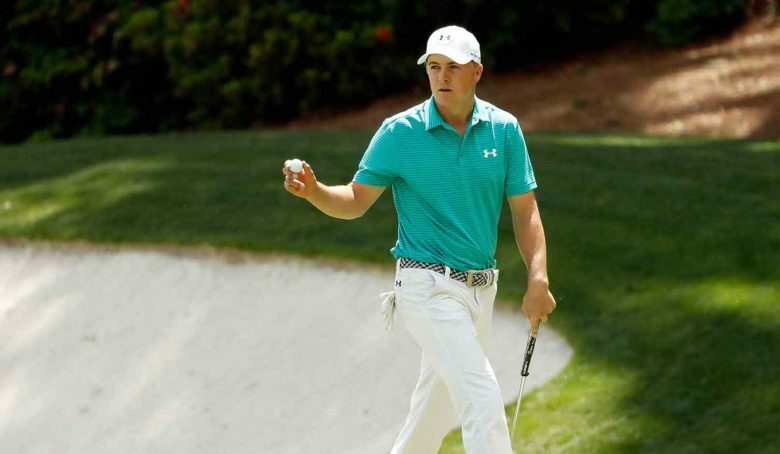 Many said it was the most anticipated Masters in years – maybe ever. The consensus was that there was so much parody at golf’s upper echelons that there was no clear favorite to win. The spotlight that comes with such lofty expectations shone brightly as round one began on Thursday morning. The first wave was off to clear skies and cool, crisp temperatures. Augusta National Golf Club looked as pristine as ever – the perfect golf course and, as it would turn out, an impeccable test of golf. The leading scores hovered just below par as the first groups made their way to the back nine. As temperatures warmed, the scoring heated up, and the afternoon wave crowded the top of the leader board. True to the hype, no one ran with the 2018 Masters in the first round. Though, Jordan Spieth certainly tried. Spieth began his round at 2-under par through his first three holes, before handing those shots back with bogeys on holes 5 and 7. He reignited his round with an eagle on the 8th hole, though, steadying himself and looking every bit the Masters champion. Never confuse Spieth’s calm demeanor for contentment. The young Texan has a hunger in his gaze that becomes apparent when he gets on a roll, as he did when he birdied five-straight holes on the back nine (13 through 17) to get to 7-under par and take sole possession of the lead. Spieth was flirting with tying the back-nine tournament record (29) as he stood on the 18th tee, but he carded bogey at the last to come back to the field. His 66 was good for a two-shot lead after round one. Trailing Spieth at 4-under par are Americans Tony Finau and Matt Kuchar. Kuchar has been steady-Eddie this season, stacking up top-10 finishes in PGA TOUR tournaments. He finished tied for 8th at the Houston Open heading into the Masters, and figured to threaten at Augusta National. True to his easy-going nature, Kuchar never panicked as he made the turn at 1-over par. He fought back, rattling off five back-nine birdies to claw into second position. After the spill Finau took celebrating his hole-in-one during Wednesday’s Par 3 Contest, it looked doubtful he could survive walking the undulating fairways of Augusta National. His dislocated ankle looked horrific – as did his popping it back into place. Finau did better than survive the first round, though. He overcame a bogey on the first hole and played 5-under golf the rest of the way to tie Kuchar. Of course, the man everyone wanted to see Thursday was Tiger Woods, who has not graced Augusta’s hallowed grounds since his T-17 finish in 2015. Woods wowed the spectators as only he can, showing flashes of the brilliance that jockeyed him to four green jackets, but his roller-coaster round would only net him a 1-over 73 and a tie for 29th place. Woods was already at 1-over par when he missed the fairway far right to start Amen Corner. His hooded recovery shot failed to hook, striking the patrons on the opposite side of the fairway. He left himself an outside chance for par with a decent approach, but walked off the 11th green with a bogey. The question then was, could Woods hold it together, or would his emotions get the better of him as they always seemed to prior to his most recent comeback. It always seemed the Woods of old would zap his frustration over a bogey with a birdie on the next hole, but he blocked his tee shot right again on the par-3 12th. His golf ball splashed feebly into Rae’s Creek, but Woods drained his improbable bogey putt after a poor pitch from the drop zone. Woods has never abided bogeys, but the save on 12 obviously buoyed his spirits. He kept his head down, draining a mid-range birdie putt on the par-3 16th to get back to 1-over par. He straightened out his tee shots, and had a makable birdie putt from the fringe on the 18th hole, but settled for a tap-in par. Woods’ playing companion, Marc Leishman, found himself in the lead for most of the early goings. Leishman’s dialed-in approach shots repeatedly leaving the Australian with makable birdie opportunities. Leishman birdied holes 2, 3 and 7 and maintained the first-round lead until the par-5 15th hole, where his second shot went long and right of the green. Leishman’s comebacker flew the green the other way and ended up wet. The resulting double bogey left him in a five-way tie for 11th with the likes of Phil Mickelson, Rickie Fowler and Zach Johnson – all at 2-under par. Those players are looking up at a only a handful of others at 3-under, including Henrik Stenson, Adam Hadwin, Charley Hoffman, Patrick Reed and Rory McIlroy. The Northern Irishman played brilliant-yet-restrained golf, looking all the while like a player who is ready to cement his legacy and win the career grand slam. He lacks only a green jacket. They say you can’t win it on day one, but you can lose it. Reigning Masters champion Sergio Garcia may have proven that axiom true when he carded a 13 on the 15th hole. Garcia was already 2-over par when he melted down, so a repeat is looking doubtful. He finished with a 9-over-par 81, at the bottom of the leader board, along with three of the five amateurs in the field. Of course, nothing Garcia could have done at Augusta National – including going John Daly on one blowup hole – will ever erase what the Spaniard accomplished at the 2017 Masters. His win then was one for the ages. This year, it seems to be anyone’s game. The 2018 Masters appears to be one where the players who can limit their mistakes and get hot for a string of holes here or there will be playing late on Sunday. It’s wide open, and round two looks set to be a continuation of the scrum that was round one.